‘Too Late’ (Live) Your browser does not support the audio element. ‘New Order’ (Live) Your browser does not support the audio element. ‘Angel In Black’ (Live) Your browser does not support the audio element. Rising’ and the crowd chanting ‘New Order’. The disc also includes two classic covers, Iron Maiden’s ’Wasted Years’ and Savatage’s ‘Power Of The Night’ and finally closing the disc with the classic fan favorite ‘Revolution Rising’. The band is comprised of veteran members from many known-named bands. Scott Oliva (ex-Wind Wraith, Innerstrength, vocals), Steve ‘Dr. Killdrums’ Wacholz (ex-Savatage/Crimson Glory, drums), Bryan Holland (ex-Tokyo Blade, guitars), Paul Kleff (ex-Metal Church live, FireWolfe, guitars), Russ Pzutto (Twisted Sister live, Dee Snider, bass), Rob Matheson (live drums). 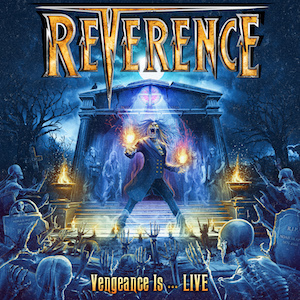 ‘VENGEANCE IS…LIVE’ is a true testament to the bands high energy stage show and stellar musicianship that demands to be played at Full Volume!